Hill Country District’s annual Lenten collection officially began Ash Wednesday, March 6. We invite & encourage your church to catch up. We collect wearable used clothes until our partners, the Seventh-day Adventists, send their trucks to collect our collections. This year, the trucks should come the week of April 8-12 to have your space cleared out before the run-up to Easter. The exact schedule will depend on which churches participate and how much each collects. Yes, they can accept hats, belts, and shoes. No, they cannot take swimsuits or used underwear. Once they have the clothes we collect, the Adventists take it to their warehouse at Alvarado where it is sorted, sanitized, packaged, and stored until there is a disaster requiring used clothing, then they load their semi and have it parked outside the shelter door in the morning when survivors wake up. The Adventists are nationally known for this disaster ministry, and they tell us the Hill Country District’s collection gives them the most and highest quality clothing of any they have all year. Why not just wait for a disaster to collect? Because by then it’s too late. The post-disaster need for used clothing lasts only 24-48 hours. After that, survivors usually can acquire new. There are exceptions, of course, and the Adventists are prepared for that. There also is a difference between survivors who NEED free clothing and those who merely WANT it. NEEDS are short-lived in this case; WANTS are always there. By the time a local church can decide to launch a clothing collection, and run the campaign, then deliver the bags to the disaster area, the NEED is over, and the bags of mixed dirty clothes are just more trash for the landfill. That way doesn’t work. Ours does. More information will be forthcoming. The more churches we have participating, the more good we can do. Any church in the Rio Texas Conference is welcome to participate. This is the contact information or you can contact Pam at the Hill Country District Office, 830-896-6400, dispro512@gmail.com. McAllen—28 volunteers came out to serve disabled people in need on Feb. 22-23. Both youth and adults served. They were joined by students from UTRGV Campus Ministries as well. Three ramps were built and two others were repaired and painted. 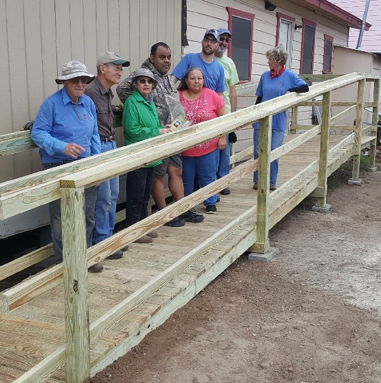 FUMC McAllen’s CORNERSTONE MINISTRY is a ministry that has evolved over the past 26 years into one that serves primarily physically disabled individuals and their families with wheelchair ramps and other assistance. 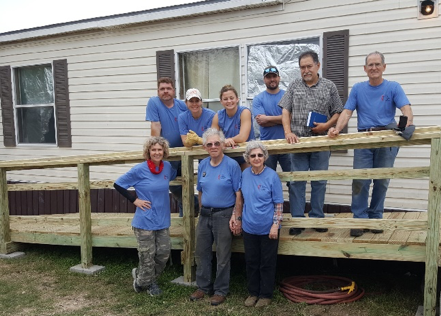 In the past few years, they have partnered with the Texas Ramp Project (TRP) in this ministry who provides us the majority of the funds for the supplies for the ramps. It is such a blessing to come together in service with our neighbors! To GOD be the GLORY! "So then you are no longer strangers and aliens, but you are citizens with the saints and also members of the household of God, built upon the foundation of the apostles and prophets, with Christ Jesus himself as the cornerstone. In him the whole structure is joined together and grows into a holy temple in the Lord; in whom you also are built together spiritually into a dwelling place for God." 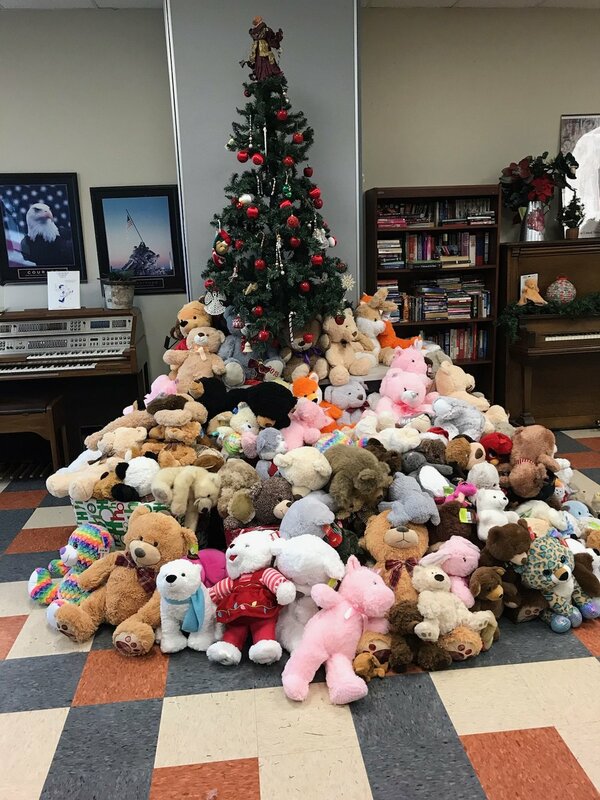 More than 300 teddy bears, kittens, puppies, rabbits, lambs, and two angry birds–were given to Oak Hill-area children at an annual Christmas party hosted by the Travis County Community Center on Saturday, Dec. 8. Members of Oak Hill UMC led a group of more than 40 volunteers that included social workers, Travis County law enforcement officers, and, of course, Santa. Together, Oak Hill UMC and the local agencies shared a morning of radical hospitality with our brothers and sisters in the community. "He was pretty blunt about that's what we got to do," Hill Country District Outreach Coordinator George Barnette said. "So who are we to argue with Jesus?" “What is so heart-warming about this is that it isn’t ‘us' donating to ‘them’ we are all in this together. Some former food pantry clients donate items and some current food pantry clients volunteer on the day of,” Jenn Clauser, director of Communications said. "Congregation and committee members donate & volunteer too, knowing that if God ever called them into hard times there’s loving help right here." On the weekend before Thanksgiving, the church went all out and provided a warm dinner with all the fixings. United Methodist Women and Moms Clean Air Force hosted the Climate Justice = Just Energy 4 All conference at Coker UMC: San Antonio on December 1 to raise awareness and discuss how climate change is impacting the nation and the city. Activists and Methodists shared ideas and discussed solutions to the ever-changing climate crisis, especially in the wake of the Fourth National Climate Assessment. UMW Executive for Economic and Environmental Justice Elizabeth Chun Hye Lee wanted to bring the annual meeting to San Antonio because of the health impacts of fossil fuels on communities in Texas, as well as promote the Just Energy 4 All campaign. UMW is planning on installing solar panels at The Holding Institute in Laredo to help offset rising costs for central air conditioning. DeeDee Belmares, a Texas Field Consultant for Moms Clean Air Force, works closely with UMW and offers tours of fracking sites. The emphasis on justice is also important for their activism. Eloisa Portillo-Morales, the City of San Antonio’s Sustainability Planning Manager for the Office of Sustainability, highlighted the city’s efforts to adapt to climate change. Last June, the San Antonio City Council passed resolutions to support the Paris Climate Accord and to become a compassionate city. The Climate Action and Adaptation Plan is being developed with 90+ stakeholders. Advocate sound policy and regulations on methane emissions: support policies that incentivize early action, drive performance improvements, facilitate proper enforcement, and support flexibility and innovation. Belmares invited Public Citizen activist Briauna Barrera to present her story about working with public officials and the community. Rev. Gavin Rogers, an associate pastor of Travis Park United Methodist Church, San Antonio, recently traveled to Mexico City to join the migrant caravan as they were continuing their journey. Rogers wanted to get to know some of the people traveling toward the United States, hear their stories, and better understand why they are risking so much to leave their home countries. Read more in the San Antonio Express-News. This week, clients coming to the food pantry received Thanksgiving Day food items as well as the regular offerings. In addition to food items, lead pastor Rev. Russell Floyd and food pantry volunteers used the opportunity to extend hospitality in additional ways. Several United Methodist Churches served as voting sites on Election Day. Churches in Austin used the day as an opportunity to offer radical hospitality to voters. By early morning on November 6, over 70 people were in line to vote at Memorial UMC in northeast Austin. “We put out coloring pages for the kids and got chairs for everyone to sit in who couldn’t stand that long”, said Rev. Cynthia Kepler-Karrer. By later in the afternoon the lines were still strong and United Methodist volunteers brought water, food, and snacks for the voters and their children. Down the road at Parker Lane UMC, more lines formed as people waited to vote and pastor Rev. 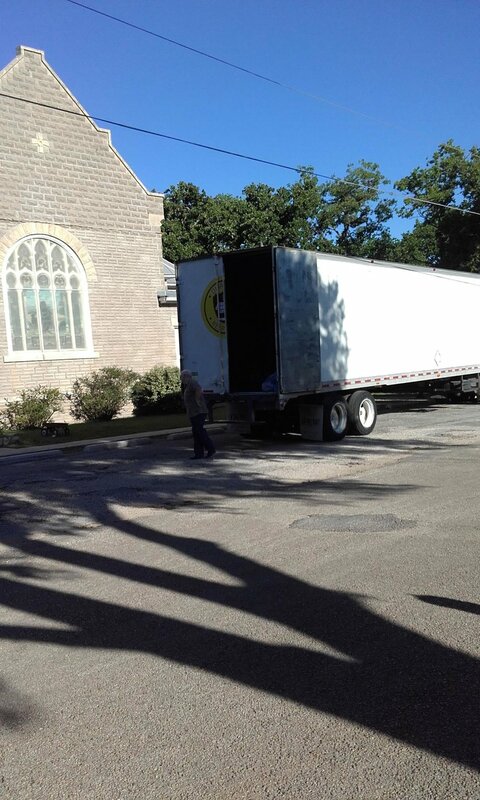 Matt Edison was onsite to offer assistance to the polling workers who needed access to a copier and other supplies. He reported over 1,100 people came to vote. By Tuesday evening, Oak Hill UMC continued to receive voters; the humidity brought lots of mosquitoes and so volunteers handed out mosquito spray and refreshments to those waiting outside. As one worker said, “The election results aren’t in yet but we’re going to go ahead and call the race for ‘the most cookies baked to hand out to voters’ for the Oak Hill UMW!” The church’s communication team also worked ahead of time to ensure information on mission projects and Christmas worship services were available for visitors. At First UMC, Austin; leaders planned a time of prayer the day after the election. It is advertised as a time of prayer for those elected and those celebrating, for those most impacted by the decisions, and for those disappointed. Members and friends of First UMC, Austin; including Rev. Taylor Fuerst and Rev. Cathy Stone; assisted as Early Responders in Kingsland with Rio Texas Disaster Response. 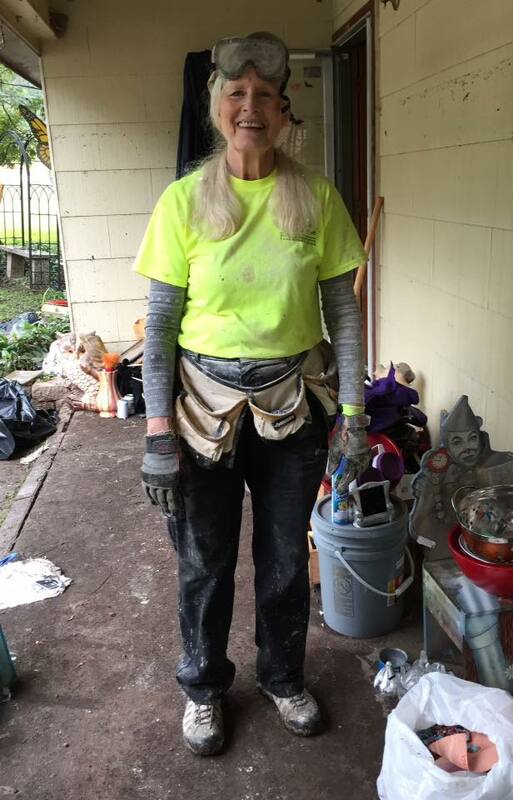 Members of the Dripping Springs UMC response team, including recently Certified Lay Minister Linda Snow, spent a day in Horseshoe Bay mucking and gutting homes as a part of the recovery efforts. Hurricane Harvey hit Texas hard in 2017. We are still—and will be for a long time—helping survivors recover. Then came flooding in the valley, after that came Hurricane Florence in the Carolinas, Hurricane Michael in Florida and just recently the Hill Country Flooding. So many people need our help and our love. If you would like to help these folks, consider signing up for the January 12th ERT (Early Response Team) training at Dripping Springs UMC. Go to https://riotexasresponse.org/ert-basic to register.